Mommy Monday: 2 Week Postpartum Update! Again, sorry about the crease-marks they are from the Belly Bandit! Here is what my belly looks like at 2 weeks postpartum. I lost another 4lbs this week, putting me at 123lbs which means I have another 8lbs to go until I'm back to my pre-pregnancy weight. I think the last couple of pounds are the hardest (and take the longest) to lose though...I remember that from last time! Also even though my belly is getting smaller the stretch marks/bellybutton area is looking more wrinkly. This is due to such a rapid initial weight loss but hopefully the skin elasticity will improve once I start working out again! (If I ever get started...ha ha!) Right now I am using a combination of Bio-Oil and Bloom & Blossom Anti Stretch Mark Cream to help fade them. I am also still wearing the Belly Bandit day & night! And of course breastfeeding helps, along with drinking at least 2L water a day! I am NOT dieting FYI - and don't intend to start cutting calories anytime soon, breastfeeding makes me ravenous! I would like to get started on some kind of workout routine again...and I use this term very loosely. I'm no gym bunny, nor do I have any intentions of becoming a fitness model but I would love to get in shape for summer. My goal for now is to just do 30 minutes of exercise 3 times a week. Eventually I hope to build up my fitness level but I'm going to start slow...I also don't intend on doing any abdominal work until 6 weeks postpartum! And here's what Eduardo looks like at 2 weeks old! 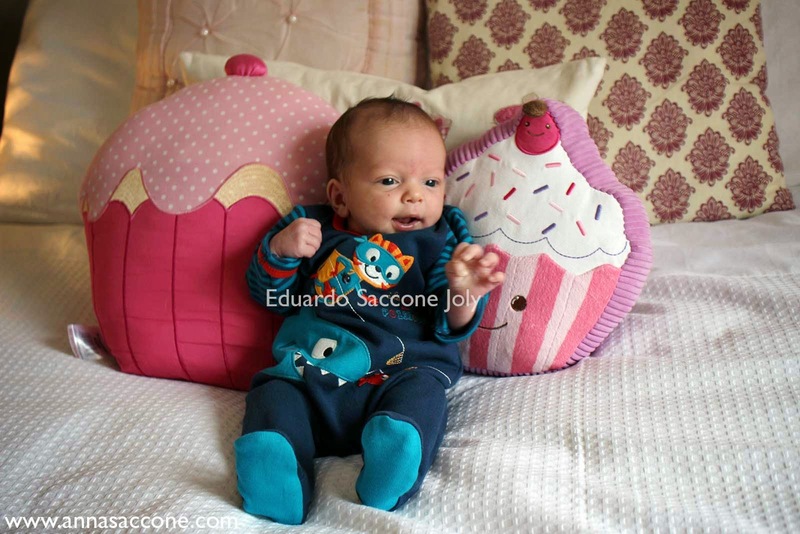 Height/Weight: We didn't get a height measurement at his 2 week doctor's appointment but he did gain weight! Yay! He now weighs 8lbs 6oz. My doctor was very happy with that and it was so encouraging to hear he is doing so well! As I've said before, it's hard to know when you're breastfeeding so I will be taking him to get weighed again next week by the PHN. Routine: It hasn't changed much at all since last week...I am still doing a mixture of feeding on demand and sticking to somewhat of a routine. I try to work around Emilia's as much as possible so that her life stays as close to normal as it can! Her schedule has also moved about an hour earlier to suit Eduardo's. 7am - We usually wake up around 7am and I give Eduardo his first feed, then he stays in our bed while I get ready for the day. 7:30/8am - Emilia wakes around and comes into our bed, then we all go down to breakfast around 8:30. 8:30-10am - Eduardo naps in his bouncer/swing till 10am and I try to get Emilia dressed & all the breakfast things put away by this time. 10/11:15am - I feed him at 10 and then again at 11:15 so he sleeps for at least an hour or two while I film/get work done. Thankfully Emilia still gets minded either by my mom or sister Erika from 10-1pm so I have this free time in the mornings! 1:30pm - I try and eat lunch with Emilia around 1:30pm and usually have to feed Eduardo while doing this (multi-tasking! ha ha). 2:30-4:30/5pm - Emilia goes down for her nap around 2:30 and Eduardo follows shortly after. This part of the afternoon is when I get all my editing/blogging done - and where I plan to eventually start fitting in my workouts! 4:30/5pm - When Emilia wakes up from her nap, Eduardo is usually ready for another feed. She usually gets a small snack & some milk on the couch with me while I feed him. Then Emilia normally goes out to play if the weather is nice. 6:30/7pm - We start getting things ready for dinner. I try to time it so that Eduardo is fed & happy in his bouncer while we eat. 7:30/8pm - We bring the two of them up for a bath. We very recently started bathing Eduardo every night, only because I noticed it relaxes him and tires him out so he sleeps better in the evenings! At the start of the week we were doing it every 3 nights, but now we just wash him in his baby bath before Emilia and alternate between using products & just water. 8:30pm - I then feed Eduardo in the glider in Emilia's nursery while Jonathan washes her & gets her ready for bed. Then we swap and I read her a bedtime story & put her down for the night. We did attempt to put Eduardo to bed in our room (where he sleeps at night) but he didn't last very long! So for the meantime he is still coming back downstairs & sleeping in his bouncer while we watch TV. 10/11:15pm - I usually feed him again at 10 and then at 11:15ish when we go up to bed. Sleeping: Eduardo is still waking about twice a night...although lately he has been WIDE awake at 5:30am and then takes a lot less at 7am which I hope he stops doing soon! 5:30 is a bit too early for me!! During the day he is still napping in his bouncer seat/swing downstairs & at night he sleeps in his co-sleeper and feeds in bed with me. Eating/Feeding: He is still feeding really well, and has been going for a little bit longer which means longer rest times too...thankfully! 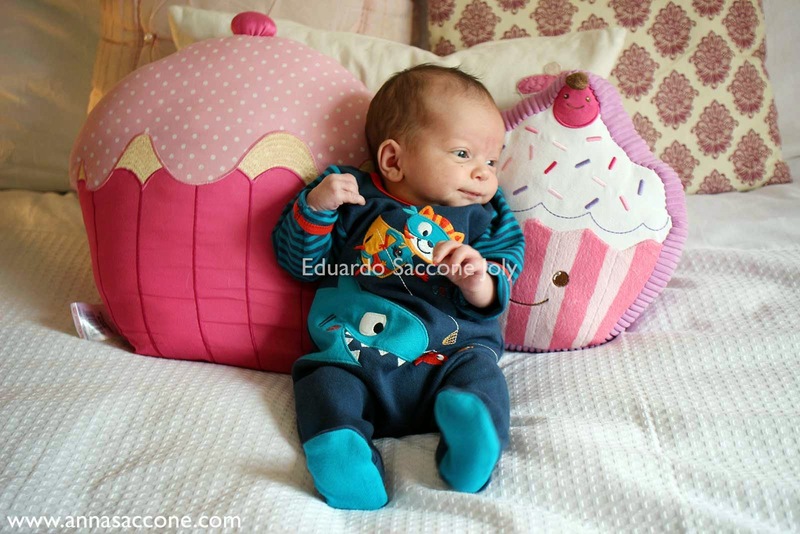 Sizes: At the moment Eduardo has just started growing out of all his newborn clothes. Pretty much all his babygrows & vests are small on him now! He is currently mostly wearing 1m clothing from DPAM and/or Zara Baby. He is wearing size 1 nappies (Pampers). Milestones: Lots of smiles...and he laughed at Emilia which I managed to catch on camera! He has also started making more sounds that aren't just crying...little gurgles & baby babble :) Our doctor commented on how aware he is for a 2 week old - he definitely has become a lot more awake & aware of his surroundings! He loves looking around him and has started reacting slightly to when we talk to him or move objects in front of him. That's all I have to report at two weeks postpartum! 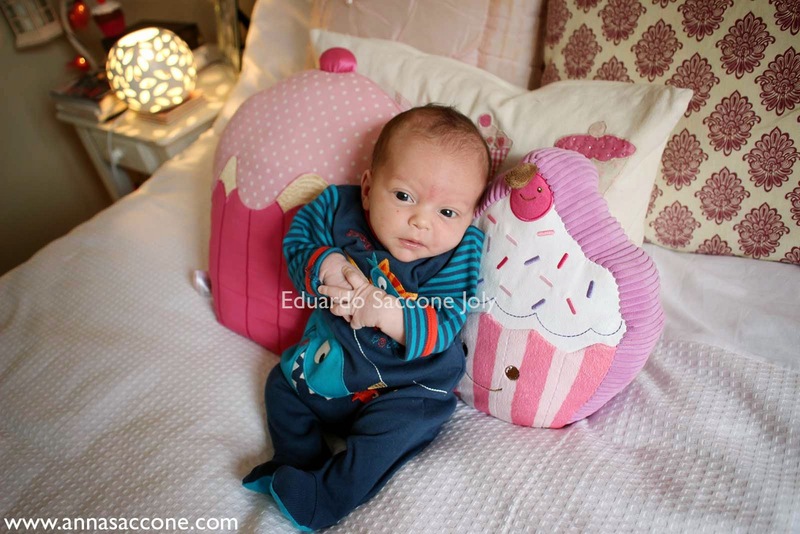 You can compare Emilia's 2 week update here! And don't forget to check out my 2 Week Postpartum Update video below!